On the west bank of the Chaopraya River in Thonburi is the historical small train station named Wongwian Yai Railway Station (สถานีรถไฟวงเวียนใหญ่). It is a small single track train station and from the main road, Somdet Phra Chao Tak Sin Road (ถนนสมเด็จพระเจ้าตากสิน), it is really difficult to realise that there is actually a train station hidden there. There is a small road with shops that runs parallel to the single railway track and passengers exit or board the trains either from the platform or from the road. 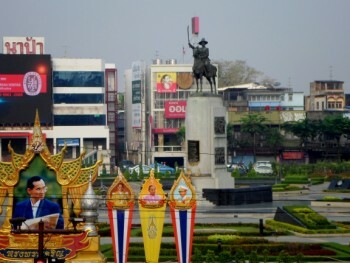 The Wongwian Yai Train Station is located close to a huge roundabout which features in its middle a big and majestic statue of King Taksin. In the 18th Century King Taksin liberated Ayutthaya from the Burmese invaders and made Thonburi the capital of the Kingdom of Siam. 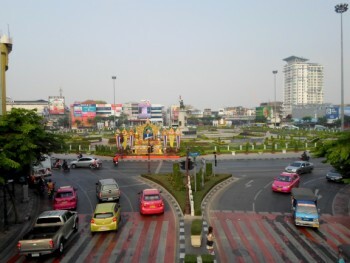 The roundabout is a major intersection linking Thonburi on the western bank of the Chaopraya River to Bangkok on the eastern bank of the river through the Memorial Bridge. 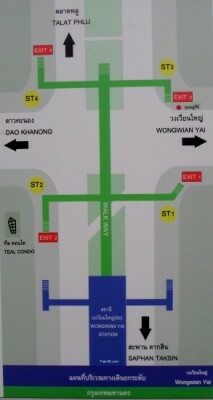 How to get to Wongwian Yai Station? One of the easiest and quickest ways to go to the Wongwian Yai Railway Station is to take the BTS Silom line up to Wongwian Yai BTS station. 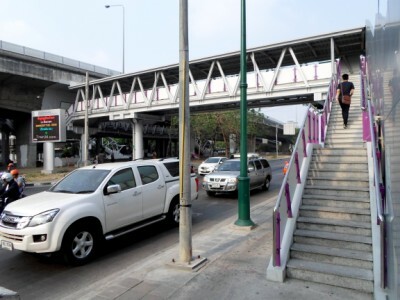 Once there take the walk way towards the Taksin Intersection and exit at the Exit 3. Walk towards Wongwian Yai on Somdet Phra Chao Tak Sin Road (ถนนสมเด็จพระเจ้าตากสิน). The train station is located on your left after the sign Somdet Phra Chao Tak Sin 2 and before reaching Wongwian Yai roundabout. Another way if you are staying along the Chaopraya River is to take a Chaopraya Express Boat to Sathorn (Taksin) pier. All Chaopraya Express Boats (Orange flag, Yellow flag, Green flag, No flag and the Blue flag tourist boat) stop at Sathorn (Taksin) pier. This pier is also named Central pier and is the origin pier of most of the Chaopraya Express Boats. Right by the pier is the Saphan Taksin BTS station and from there just follow the same way to Wongwian Yai as explained previously. The buses that stop at the bus stop near the train station on Somdet Phra Chao Tak Sin Road are the regular (non-air) buses 20, 21, 37, 68, 82, 85, 101, 105, 120 and the air-con buses 6, 10, 34. 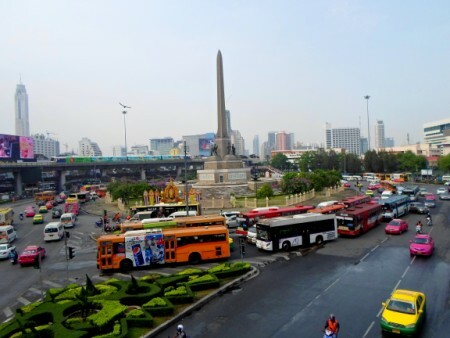 There are also many buses that go to Wongwian Yai just by the train station as it is a major bus hub for the BMTA (Bangkok Mass Transit Authority). Some of these buses are coming from Bangkok by the historical Memorial Bridge (สะพานพูทธ) that links the old area of Bangkok to Thonburi. 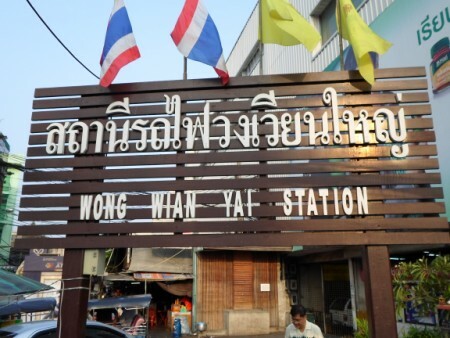 The Wongwian Yai Train Station has commuter trains going back and forth to Maha Chai (มหาชัย) – South-West of Bangkok – on the Mae Klong line. 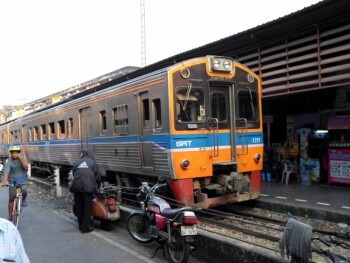 The commuter trains are used by locals to go back and forth from Bangkok to Samut Sakhon and Samut SongKhram. 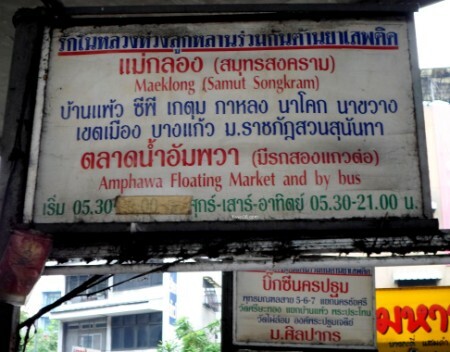 It is also used by local and foreign tourists to go to the famous Mae Klong “Train Market” and to Amphawa Floating Market. 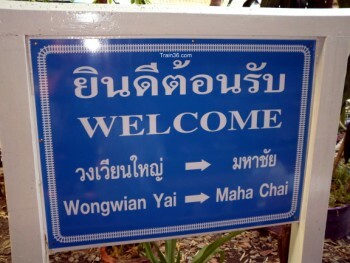 At Wongwian Yai Station the ticket counter is located at the start of the platform. The journey to Maha Chai takes around 1 hour. 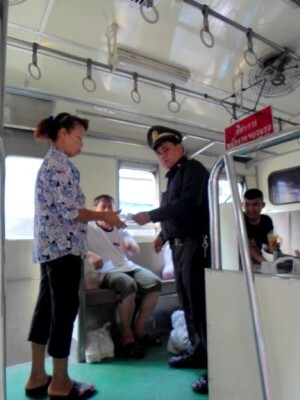 A ticket from Wongwian Yai to Maha Chai costs 10 THB. 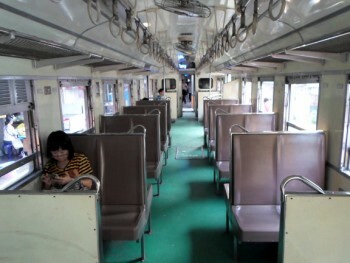 NB: There used to be air-conditioned coaches (25 THB up to Maha Chai) running on this line. At the time of writing only fan coaches were running and no-one could tell us for sure if in the future air-conditioned coaches would be reintroduced. There are 17 daily commuter trains going to Maha Chai and 17 daily commuter trains coming from Maha Chai. 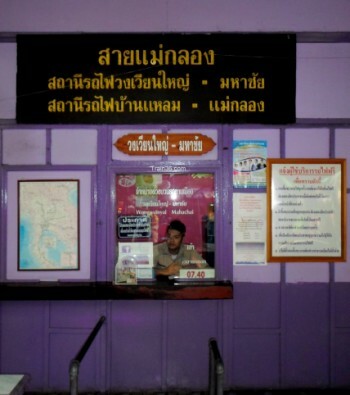 From Wongwian Yai railway station, the 1st train leaves at 05.30 and arrives at Maha Chai at 6.23 while the last train leaves at 20.10 and arrives at 21.00. From Maha Chai the 1st train leaves at 04.30 and arrives at Wongwian Yai at 05.23 while the last train leaves at 19.00 and arrives at 19.59. 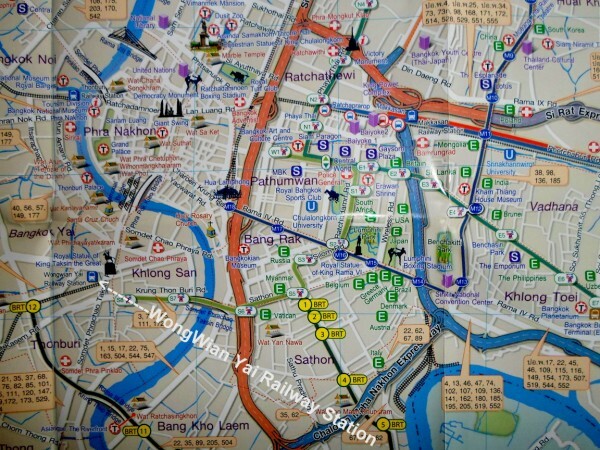 Another interesting area to visit or to catch the train from along this line, is the Talat Phlu railway station which is around one and a half kilometres from Wongwian Yai in an old area of Thonburi. 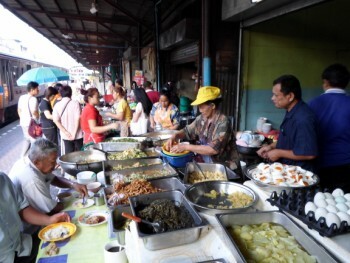 The Mae Klong Market (ตลาดแม่กลอง) also known as “Train Market” is famous all over the world. It is located in Samut Songkhram (สมุทรสงคราม). It serves as a train station as well as a fresh food market! It sells fresh seafood, fresh fruits and vegetables…and operates as a train station! 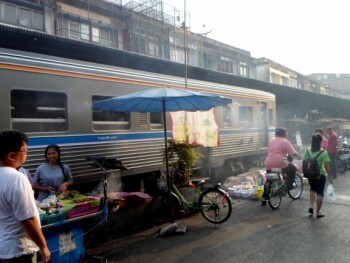 Like in Maha Chai the stalls and products are right along the railway tracks which are actually used as the main walking alley. As a train approaches, it blows its horn a first time to signal its arrival but market vendors don’t clear the way before the last minute and the second horn. It is quite exciting and scary to see the train entering the market and moving so close to people and the market stalls. From Maha Chai you can take a boat (around 3 - 5THB) to cross the Tha Chin River (แม่น้ำท่าจีน) to Ban Laem Train Station (สถานีบ้านแหลม). 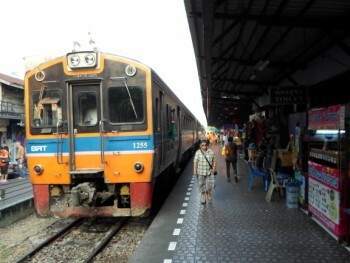 From there you can board a train for the Mae Klong Train Station (สถานีแม่กลอง). 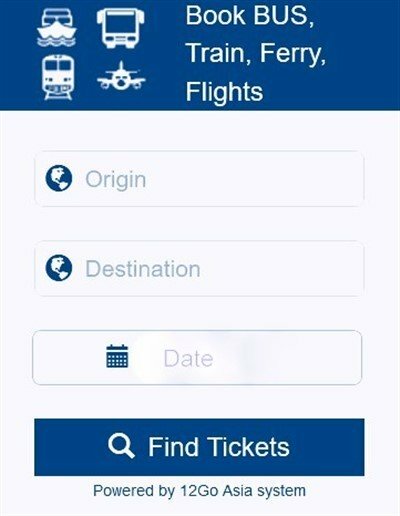 The journey takes around 1 hour. A train ticket from Ban Laem to Mae Klong costs 10 THB. 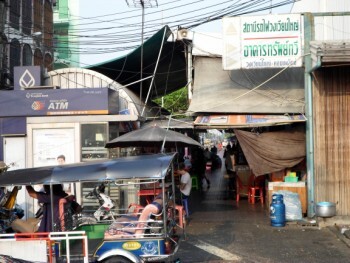 Be aware that there are many minibus services running in between Bangkok and Mae Klong. It is a faster way to travel so you might choose to go to Mae Klong by train and come back by minibus / van.